The Panorama Pyrometer® CellaTemp® PA 43 with an innovative optical arrangement and no moving parts comes with a rectangular measurement area. 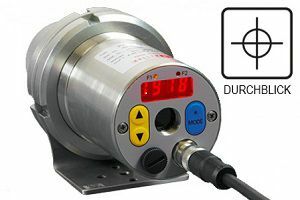 The pyrometer works according to the two-colour measuring principle; therefore, the measurement area does not have to be filled completely by the hot target object. For example, a wire may move at random within the measurement area. Yet the pyrometer provides always a secure measurement reading within milliseconds. The target marker in the through-the-lens sighting device or, when using pyrometers with a video camera, the monitor in the control room, show the exact position and size of the rectangular measurement area.